Free Spirit Wheel of Wealth Classic Slot Guide & Review - Casino Answers! Free Spirit Wheel of Wealth is a 3-reel, 1-line classic slot machine developed by Microgaming, featuring a wild symbol, multipliers and bonus game. You can play the Free Spirit Wheel of Wealth at Lucky Nugget Casino and First Web Casino. Free Spirit Wheel of Wealth has a $1 fixed coin value, thus all bets are either $1 or $2 per spin. To play Free Spirit, hit “Bet One” followed by “Spin” for a $1 bet or “Bet Max” for a $2 bet. Casino Answers recommends that you play the 2-coin maximum bet to be eligible for the bonus game. There is also more value when playing for the top jackpot on a 2-coin wager. The top jackpot symbol on Free Spirit Wheel of Wealth is the Free Spirit symbol. 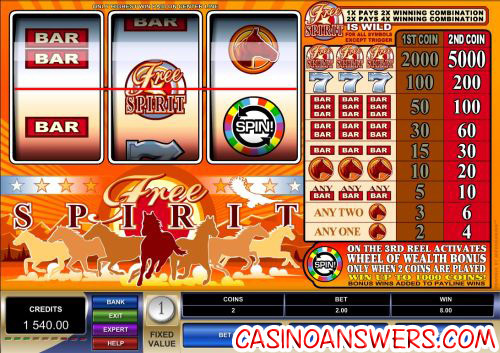 To win the 5000 coin top jackpot, you must hit 3 Free Spirit symbols on the center payline. The Free Spirit symbol is wild for all symbols in Free Spirit Wheel of Wealth except for the bonus symbol. When completing a winning combination, 1 Free Spirit symbol acts as a 1X multiplier; 2 Free Spirit symbols act as a 2X multiplier. When the Wheel bonus symbol appears on the third reel, you will trigger the Wheel of Wealth bonus game. The Wheel bonus symbol will only appear when playing two coins. 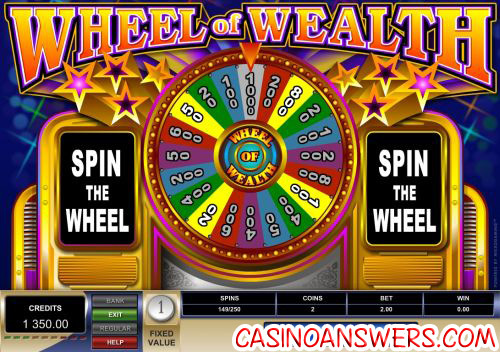 In the Wheel of Wealth bonus game, you must spin the wheel to collect a prize of up to 1000 coins. The Wheel of Wealth bonus game can win you a lot of money when playing Free Spirit for real money at Lucky Nugget Casino. There are 9 winning combinations on the Free Spirit Wheel of Wealth slot machine. They include (1/2 coin payouts in parenthesis): 1 Horse symbol (2/4), 2 Horse symbols (3/6), any 3 Bar symbols (5/10), 3 Horse symbols (10/20), 3 Single Bar symbols (15/30), 3 Double Bar symbols (30/60), 3 Triple Bar symbols (50/100), 3 Seven symbols (100/200), 3 Free Spirit symbols (2000/5000). Free Spirit Wheel of Wealth is a reel slot machine with a good top jackpot and also a bonus game where you can win lots of cash as well. To play the Free Spirit Wheel of Wealth slot machine, get 30 free spins to try it out at Lucky Nugget Casino! Are US players able to play the Free Spirit slot for real money? Unfortunately, Americans are unable to play Free Spirit Wheel of Wealth for real money at Microgaming casinos. To play a US-friendly slot with a similar bonus game, play the Wheel of Chance games at Go Casino. You can read our 5-Reel Wheel of Chance Video Slot Review. Where can I play a Flash game of Free Spirit for free? A Flash game of Free Spirit Wheel of Wealth is available at Lucky Nugget Flash Casino and First Web Flash Casino along with 200 out of 400 of Microgaming’s casino games. If you experience problems with the Flash casino, try downloading the latest version of Adobe Flash Player. What other Wheel of Wealth games are available at Microgaming casinos? You can play Wheel of Wealth, Wheel of Wealth Special Edition and Spectacular Wheel of Wealth at Lucky Nugget Casino and First Web Casino. How do I activate the Wheel of Wealth bonus game on Free Spirit? To trigger the Wheel of Wealth bonus game, you must have the Wheel bonus symbol appear on reel 3 on a 2-coin spin. Hit “Bet Max” to ensure eligibility for the Wheel of Wealth bonus game. How come I can’t change the coin value on the Free Spirit slot game? Free Spirit Wheel of Wealth is a fixed value slot machine, meaning the only coin value available is $1 (or 1 unit in your preferred currency). How much can I win playing Free Spirit Wheel of Wealth? If you hit the top jackpot of 5000 coins on Free Spirit Wheel of Wealth (3 Free Spirit logos), you will win $5000. In the Wheel of Wealth bonus round, you can win up to $1000.